Developed for the U.S. market, and available midway through 2017, BMW’s K1600B made its official debut today at the Peterson Museum in Los Angeles. The new bagger model is based on the Concept 101 Bagger we reported on in May 2015. Expect the base price to be around $20k, while a fully loaded unit will retail around $25k. 6-cylinder in-line engine according to EU4 regulations with an output of 160 hp at 7,750 rpm and a maximum torque of 129 lb.-ft. at 5,250 rpm. Reverse-assist for even simpler maneuverability as an optional equipment item ex-works. Intelligent Emergency Call as an ex-works option for rapid assistance in the event of an accident or in emergency situations (only in European markets where ConnectedDrive is available). From BMW: The presentation of the “Concept 101” concept study as part of the Concorso d’Eleganza Villa d’Este in spring 2015 was an impressive new chapter for BMW Motorrad in the history of BMW Motorrad Concept Bikes. 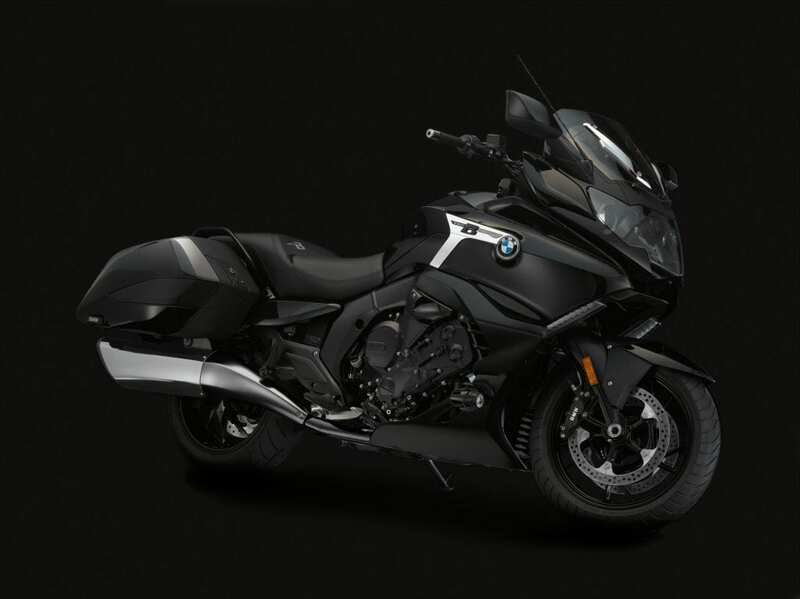 This BMW Motorrad interpretation of motorcycling on endless highways, the dream of freedom and independence and the embodiment of “Grand American Touring” now becomes reality in form of a series version of the new K 1600 B bagger. The characteristic streamlining with a low rear section and masculine colour scheme make for relaxed dynamic elegance. Side cases with newly designed compartments and folding rear mudguard for easy dismantling of the wheel. High visual impact and effective wind and weather protection. New reverse assist feature for comfortable manoeuvring and Shift Assistant Pro for shifting up and down without activating the clutch. The new K 1600 B is particularly easy to manoeuvre thanks to the reverse assist feature. This is activated conveniently at the press of a button on the left-hand handlebar panel. Pressing the starter button initiates movement. The Shift Assistant Pro available as an option allows the rider to shift up and down without activating the clutch in a large number of cases. Comfortable foot rests for a “feet forward” position and optional exclusive forged wheels for individualisation.